For some people, a 1,000-pound slab of butter makes for a great start to a bikini-model wrestling tournament. And some people see the raw material for a life-size sculpture of two iconic Star Wars figures. To each their own. To each their (lonely, virginal) own. 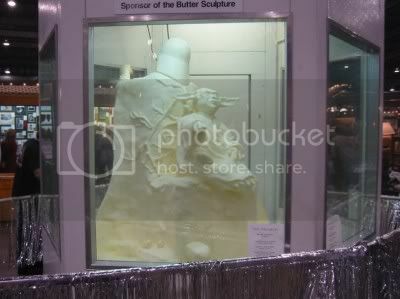 Each year at the Tulsa State Fair, an artist is commissioned to make a sculpture out of butter. 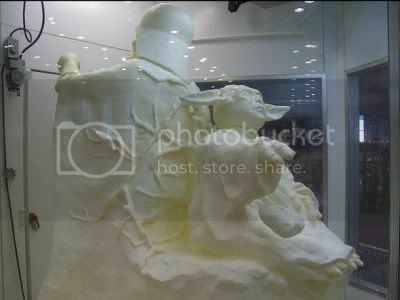 In past years, cows, farmers, and baseball players were created out of hundreds of pounds of butter. This year, in celebration of Star Wars’s final episode, TSF is featuring Darth Vader and Yoda, all dairy-like. That’s right. These photos are incredibly dated. But since when does anyone remember anything that happened on the Intertubeways more than a week ago? Even if you’ve seen these before, you probably don’t even realize it. Just wait ’til you see the video I’m saving for a post next week. I don’t want to spoil the surprise or anything, but let’s just say that a spastic fat kid swinging around a metal rod like it’s a lightsaber = hilarity. You’re going to love it. In fact, I wouldn’t be surprised if it became an internet sensation. Mark my words, people! 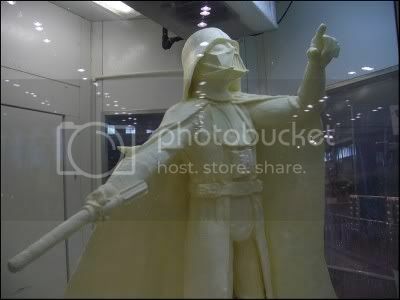 Is Butter-Yoda force-lifting a butter-stone? Pretty sweet. And yes, please bring back the Star Wars Kid. Miss him. Is it just me or does Vader look like he’s singing “When you wish upon a star” while holding a billy club? Next post: Geek Steal: 65% off Buffy The Vampire Slayer – Collector’s Set!